This is fascinating. I had no idea of the potential out there. Tom's breeding program is really what got me hooked. His TPS is the best "deal" for the money I've seen. I feel like each packet is almost priceless. Off-topic here but do you still have bees? We just got our first two packages of bees this weekend. So exciting! Yes. I've expanded to about 10 hives. I think if you cover it with soil to have the roots form gives you better chances of survival of that plant. I don't have time to edit a post about bees now, but I will start a new topic soon on natural pollinators. I have some interesting data from others and data that no else would have..my own...and I will work the two realms of data into a great mini chapter for creating diversity from potatoes using natural tools/insects to get seed set with potato berries. They are & have been covered with soil. I just wondered, since Tom mentioned the lack of hair roots on my first (leaf-less) pulls, if I should wait for hair roots to form before pulling these new, leafed-out shoots. Those tubers I'd already pulled from resprouted. They sent out nice, thickly-stemmed & leaved shoots this time. So I pulled them and they did have plenty of hair roots. Gobs of root mass. I've potted them into 4" pots and have them outside to gain some size before planting out. I stuck these new sprouts in the same pots I'd put the old, mostly leafless sprouts in. As I emptied out the dirt, I was able to inspect the prematurely-pulled sprouts. The smaller ones were, as predicted, doing nothings. However, some of the larger ones were trying to push leaves up. I don't expect much from them but I did take the hardiest-looking of the bunch and put them into one pot, just to observe. Experimenting is cool, sometimes even in spite of screwing up. That sounds pretty good. I haven't pull more sprouts this week I am waiting until Saturday. I agree experimenting is fun. And I like the learning process. 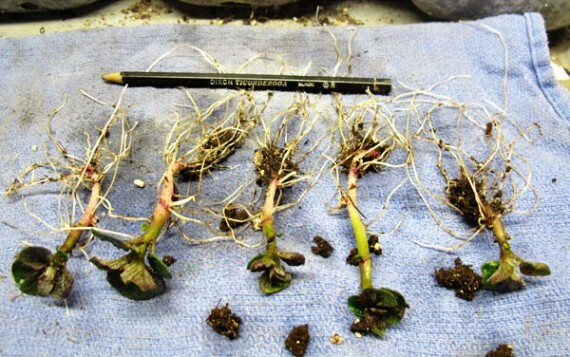 Since this topic is "Pulling potato plants from sprouts" I thought it best to compare pull sprout/plants of regular potatoes to sweet potatoes. 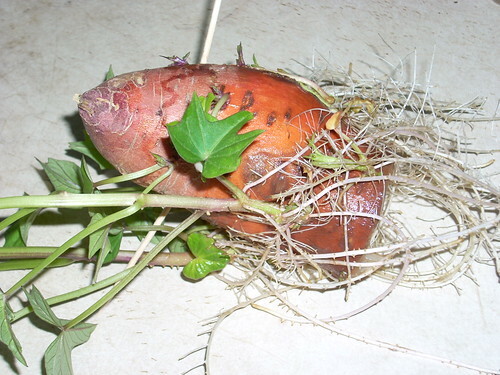 Sweet potato plants are sold and bought as "slips". I suppose we could say Irish Potato Slips. 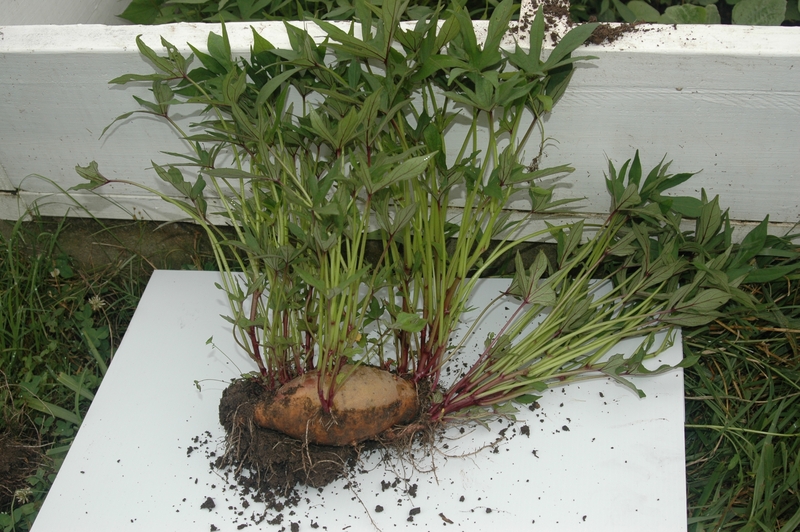 The main thing to consider is that sweet potato slips are fairly leafy when pulled from the sweet potato root. They usually at least some roots. I am including a few links to photos below to show how this is somewhat similar to sprout pulls from potatoes. The same tubers are putting out left & right after that first pull. I have a 'desiree' just starting to sprout. 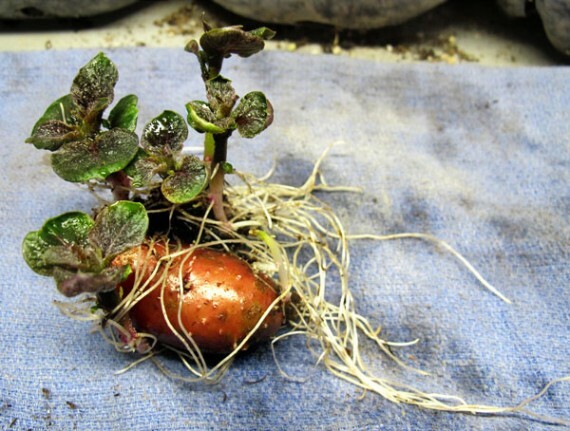 If I pot it inside now pull sprouts, then plant sprouts and original seed potato in a week or two will I have a greatly improved yield over just planting it now with my other seed potatoes? not sure about bigger yields since I am trying this for a first time but my reason to try is to double my chances of getting a particular spud to set tubers to save for seed or to get a later crop. owiebrian, wow! those pulls are amazing. You are definetively doing a great job. Best wishes that those take well once planted, I am sure they will. I guess I will just give it a try and find out! I will like to see hear your findings in terms of yield too. Do you happen to have a second potato for comparison to plant as is? I got last year 14lb from one pound planted ...granted each potato was a single variety the most productive gave me 2.5lb from one walnut size tuber seed. well, I have never tried to produce more than a few before this. I am growing yukon gold, yellow finn,red lasoda,german butterball,yukon gem, caribe,all blue, russian bannana,french fingerling,princess la ratte,austrian crescent,all red, viking purple, desiree, and a couple that I'm not sure of variety. About 180' of plantings. And about 140' of raised beds for a second planting this week.